Water, food and energy security and environmental safety are key challenges to our societies. “Information on water quantity and quality and their variation are urgently needed for national policies and management strategies, as well as for UN conventions on climate and sustainable development, and the achievement of the Millennium Goals” . Better water resources management requires fundamental understanding of the water cycle, water climate and water ecosystem interactions and impacts of human activities in the Earth’s climate system. Quantitative earth observation, hydrological modelling and data assimilation provide a powerful combination to quantify hydroclimatic variables for effectively addressing water management issues. In support of the Netherlands policy in development cooperation , we are actively engaged in research and education in applications of earth observation technologies to monitor water availability and food security in terms of water quantity and quality, and water disasters in terms of floods, droughts and water pollutions, particularly in developing countries where an in-situ monitoring network is often missing. Our research activities are organized in four clusters. Retrieval of surface parameters addresses the question which physical quantities can we actually observe with remote sensing instruments, in particular with sensors operating in a broad range of the electromagnetic spectrum, from the visible, through the near and shortwave infra-red, the thermal domain, up to and including the microwave region. In trying to answer this question, radiative transfer models are applied. Observations from satellites always take place across several media, so the coupling and mixing of models involving different components of the system is very important. With coupled models that include the atmosphere it is possible to study quantitative relationships between object properties on the ground and top-of-atmosphere observations by a satellite. From these quantitative relationships one can derive methods and algorithms to retrieve surface parameters from observed remote sensing data. Water scarcity in water limited environments, mainly attributed to declining groundwater resources, is one of the main problems of the 21st century. At the interface between hydrogeology and ecohydrology, the impacts of ecosystems, land cover and climate change on the groundwater balance is compared to those of other components. Here we will focus on spatio-temporal assessment of subsurface fluxes with an emphasis on groundwater fluxes and interactions between plants and groundwater. If based on reliable data, coupled, saturated-unsaturated models are very powerful tools, not only in water and natural resources management, but also in studies on the impact of land cover and climate changes on groundwater resources. The recent technological advances in earth observation, i.e. in remote sensing, geophysics and automated field monitoring, create unique opportunities to improve the reliability of such models. Water security can be defined as the ability to access sufficient quantities of clean water to maintain adequate standards for food and goods production, sanitation and health. It is of vital importance, because the world is already facing severe water shortages, due to climate and/or human impacts in many parts of the world. Aquatic and coastal ecosystems face similar security threats from climate and weather variations, combined with human influences. In order to evaluate security risks, one must work towards an improved quantitative understanding of the complex relations between the impacts of climate on river discharges, sediment budgets, nutrients and chemical contaminant flows and morphology. 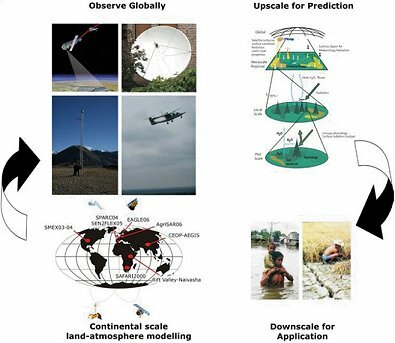 Improved understanding of system behaviour can be obtained using Earth Observation together with experimental in situ data and integrated modelling approaches applied to the various processes. An emphasis is put on assessment and monitoring of water quality and biogeochemical variables, being prime indicators of water and environmental system behaviour. What tools can be further developed/improved to predict the water cycle components (to measure, simulate and predict water cycle quantity and quality in space and time)? How can we assess the impacts of and the vulnerabilities to future climate change in water resources and what is the potential to adaptation in water resources management? Observations from space and in situ of water cycle components and their interactions with ecosystems, climate and human activities provide opportunities to address most of the above questions. Beleid ten aanzien van ontwikkelingssamenwerking, kst-32605-2 ISSN 0921 - 7371 ’s-Gravenhage 2011. To contribute to ITC’s overall mission “Space for sustainable development”, the Department of Water Resources aims to: “Create and Transfer Knowledge in Water Resources and Environmental Management using earth observation and spatial information technologies”. Ecosystem and human interactions (source: NASA).